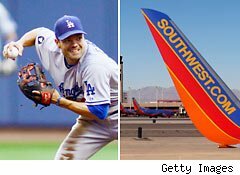 Baseball fanatics won't have to miss one tobacco spit or big hit while flying now that Major League Baseball will stream games to airline passengers' WiFi devices. That means if you have a smartphone, laptop or tablet, you'll have access to more than 2,400 games onboard, broadband provider Row 44 announced Tuesday, making America's pastime the first major sport to offer live streaming on commercial carriers. Open up a bag of complimentary peanuts, have the flight attendant fetch you an overpriced beer, and you can almost have a ballpark experience at 36,000 feet. The deal will first be available on Southwest (LUV), a partner of Row 44, for $5 a flight. "The integration of live baseball games into Row 44's in-flight broadband entertainment experience ensures our traveling fans won't have to miss a pitch," Bob Bowman, CEO of Major League Baseball Advanced Media, said in a news release. Earlier in August, American Airlines launched its own in-flight streaming product for movies, perhaps signaling that carriers will focus more on personal viewing devices that passengers bring with them. The move could potentially save the airlines money on developing their in-house entertainment broadcasting with their own equipment.